Your heating and air conditioning systems have a big job keeping your home or business comfortable throughout the year. Cold temperatures in the winter and high heat and humidity in the summer can really put a strain on your equipment. That’s why you need to call Quality Air Heating and Air Conditioning for all your heating and air conditioning service in Plain City, OH. We offer a complete line-up of services including installation, repair, maintenance, and replacement for many types and brands of systems. Our technicians are highly trained and have years of experience in the field. If you aren’t getting enough heating or cooling or if you’re ready to have a new system installed in your home, just let us know. We offer 24/7 heating and air conditioning repair in Plain City, OH so call us anytime. If you need any type of heating system service in Plain City, OH you need a contractor that you can trust to deliver high quality service on every job. Quality Air Heating and Air Conditioning offers a complete line-up of heating installation, repair, maintenance and replacement services for many types of heating systems including furnaces, heat pumps, ductless mini split heating systems and much more. Call us today and one of our Plain City, OH heating experts can talk with you about any service that you need. You likely use your heating system a lot during the winter, which could lead to the development of a variety of problems. If your aren’t getting enough heat, or your system is making any new noises, call Quality Air Heating and Air Conditioning for heating repair in Plain City, OH. Our technicians can handle any issue that your system might be having and we can work on a large range of systems including furnaces of all types, heat pumps, geothermal systems and much more. Poor installation is one of the main causes of heating problems, so make sure that you call the Plain City, OH heating installation professionals at Quality Air Heating and Air Conditioning when you need a new heater in your home. If you’re not sure which size heater you need or which type, just call us and our technicians can talk with you about all of your options. We’re ready to get started so call us today! Staying cool in the summer can be hard, but when you have a good cooling system you’ll likely be able to come home to a nice cool house. If your air conditioning system isn’t operating up to par or if it’s time to have a new system installed, call Quality Air Heating and Air Conditioning. We have a range of air conditioning services in Plain City, OH for all types and brands of systems. Whether you have a heat pump, central AC, ductless mini split AC or a geothermal system, our experts can help with any kind of service that you need, so call us today. Don’t wait to call a professional for air conditioning repair in Plain City, OH. Allowing your air conditioning problems to go undiagnosed could allow them to get larger and more costly to repair. Quality Air Heating and Air Conditioning offers 24/7 air conditioning repair in Plain City, OH because we know that there will be times when your system breaks down unexpectedly. We are dedicated to responding quickly to your call and we specialize in getting your repair work done as quickly as possible. Getting your new air conditioning system installed professionally is one of the best things that you can do for the comfort and efficiency of your home. Make sure that you call Quality Air Heating and Air Conditioning for all your air conditioning installation in Plain City, OH. We can install any kind of AC that you want and we’ll make sure that the system you choose is the right size for your home so that it operates as effectively as possible. Keeping your air conditioning system well maintained is a great idea for any homeowner that wants to reduce the need for repair, increase the efficiency of their AC system and also extend its life. Quality Air Heating and Air Conditioning offers outstanding air conditioning maintenance in Plain City, OH for all kinds of systems. Our maintenance program includes a host of perks for our members including reduced pricing, priority service, extended warranties and more. If your air conditioning system stops operating at all, you should call Quality Air Heating and Air Conditioning for air conditioning replacement in Plain City, OH. But even if your AC is still working, you could still benefit from replacing it. Older air conditioners usually operate less efficiently and require more repair. By replacing your system early you could be able to increase the efficiency of your home as well as your comfort. Call Quality Air Heating and Air Conditioning today to talk with one of our experts. 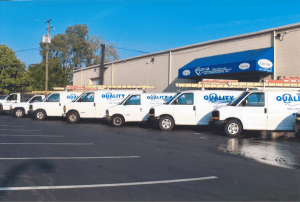 Quality Air Heating and Air Conditioning is proud to work with businesses of all types to provide them with high quality commercial HVAC service in Plain City, OH. Our expert technicians are highly trained and have years of experience in the commercial HVAC business. If you need installation, we’ll help you find a terrific system that fits your budget and meets your business’ needs. If your HVAC system is having any issues we also provide 24/7 commercial HVAC repair in Plain City, OH. Because of all the use that your HVAC system gets throughout the year keeping your business’ interior comfortable, it can run into problems from time to time. While this can be frustrating, all you have to do is pick up the phone and call Quality Air Heating and Air Conditioning for commercial HVAC repair in Plain City, OH. Our skilled technicians can handle any issue that you might be having. Whether it’s new noises coming from your system or it’s that you aren’t getting enough heating or cooling, call us anytime, 24/7, for commercial HVAC repair in Plain City, OH. Having a new HVAC system installed at your business is no small decision. You’re likely going to be spending quite a bit of money on your new equipment and you’ll also be using your system almost constantly. Make sure that your new equipment can stand the test of time by calling Quality Air Heating and Air Conditioning for commercial HVAC installation in Plain City, OH. There are few things more beneficial to the efficiency and life of your new HVAC system than professional installation. Here at Quality Air Heating and Air Conditioning, we can install any type of equipment that you want and we’ll get it done with the high quality of service that our customers expect from us. Call us today! As your heating and air conditioning systems operate, they will invariably start to develop small and unnoticeable problems which could eventually balloon into larger problems. Getting your HVAC system regularly tuned up and inspected could allow your technicians to find those problems and fix them before they cause further damage. Quality Air Heating and Air Conditioning offers total commercial HVAC maintenance in Plain City, OH for all types of systems. Our maintenance program includes regular tune-ups, reduced pricing for our members and also extended warranties. Call us to learn more. Is your heat pump not producing enough heating or cooling? Is your current HVAC system ready to be replaced and you’d like more information on heat pumps? Call the Plain City, OH heat pump experts at Quality Air Heating and Air Conditioning. We’ve worked with all types and brands of heat pumps and we can help with any type of service that you need. From repair and maintenance to installation and replacement, Quality Air Heating and Air Conditioning is the one-stop-shop for all your heat pump service in Plain City, OH. When your furnace stops working well or when you need to have a new system installed, call the Plain City, OH furnace experts at Quality Air Heating and Air Conditioning. We offer a large range of services for all types of furnaces including installation, repair, maintenance and replacement for gas, electric, and propane systems. Call us today to talk with one of our Plain City, OH furnace professionals.